Intel has finally revealed an Optane product and told us how fast it will go. The TL;DR version is that the “Optane SSD DC P4800X” will ship by year-end, starting with a 375GB product that has amazing computed random read IOPS numbers, and can work as memory or as storage. Intel says the SSD is built with 3D Xpoint media, plus its own memory, controllers, interconnect IP and Intel software; we get it; wall-to-wall chipzilla tech makes the sucker go faster for longer, etc. It claims the P4800X has "an industry leading combination of low latency, high endurance, QoS and high throughput." IT has breakthrough performance, predictably fast service, is responsive under load and has "ultra endurance." The "ultra" endurance claim rests upon the P4800X having a 30 drive writes per day (DWPD) rating compared to a 0.5 to 10 DWPD rating for NAND SSDs. It says the P4800X has up to 2.8x more total bytes written at similar capacity to a DC P3700 SSD with its 17 DWPD for 5 years. Intel claims the P4800X is 5-8x at low queue depths and this is relevant because the majority of applications generate low queue depth workloads, rather than just relying on raw IOPS. It therefore says the P4800X is "Ideal for critical applications with aggressive latency requirements." 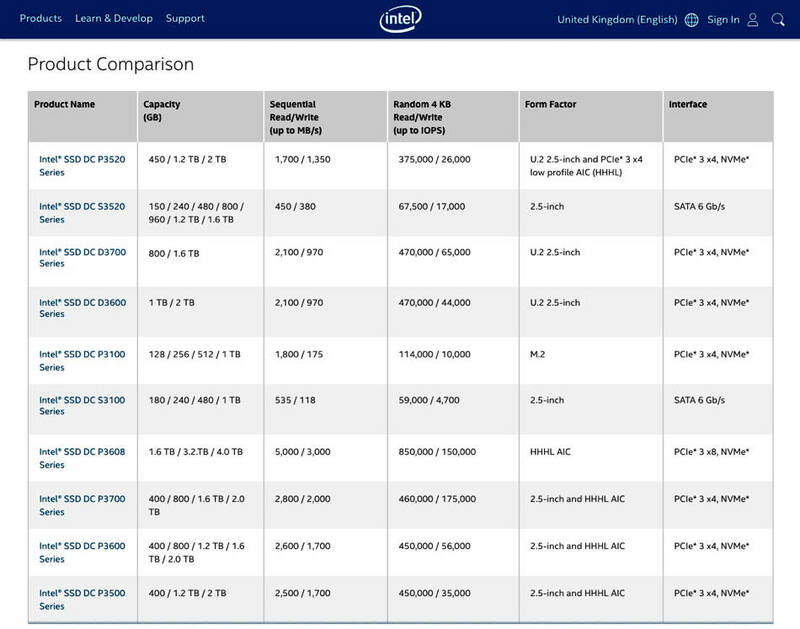 Annoyingly Intel is not providing direct performance numbers, instead relying on multiples of DC P3700 SSD performance. This is a 2D 20nm MLC (2bits/cell) NAND drive launched in June 2014. P3700 capacity points are 400GB, 800GB, 1.6TB and 2TB. Its sequential read/write IO latency is 20/20 microsecs. We’ve built a table comparing the two drives, using Intel-sourced numbers for the P3700 and then calculating the P4800X numbers using the Intel briefing multiples in the slide below. Intel slide comparing P3700 and P4800X SSD performance. All table numbers are “up to.” P3700 quality of service data can be found here and we’ve used the 400GB capacity write number. We were unable to find P3700 responsiveness under pressure numbers. 200MB/sec write pressure 12.5x ? 400MB/sec write pressure 25x ? 600MB/sec write pressure 35x ? The significant number for us here is the random read IOPS. Previously, and according to a leaked Optane P4800X datasheet, the random read IOPS were up to 550,000. Our computed value of 4,600,000 is so far away from 550,000 as to leave us incredulous. 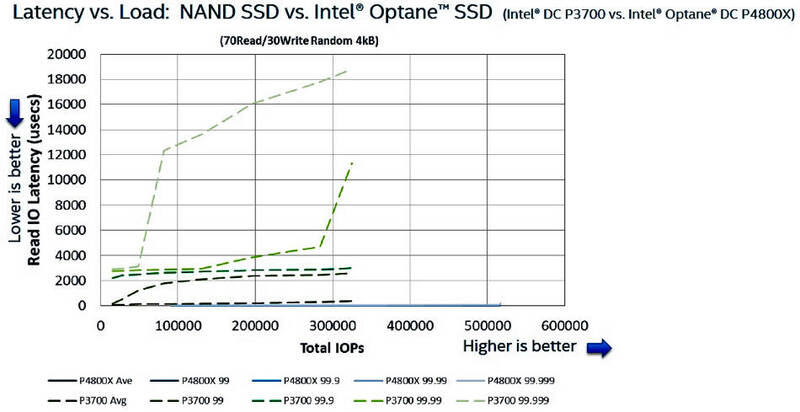 And yet Intel's Optane deck is Intel's Optane deck and Intel's DC P3700 random read IOPS number is indeed Intel's DC P3700 random read IOPS. Intel DC P3700 performance numbers. Click image for larger view. Perhaps computing a number from two "up to" numbers is taking us some way away from the real world? As for Intel's claims, they are plausible. 3D Xpoint is certainly fast enough media. The question is, can their controller/firmware provide such a figure? The world's best NAND devices are around 1 million 4K random reads, at high queue depth loads. NVMe allows 64K queues each of 64K depth, and to the extent Intel has leveraged that capability, 4.6 million is certainly not out of the question. How does it compare to competing NVMe SSDs? Samsung's PM1725a NVMe SSD (48-layer 3D TLC NAND) does up to 1,050,00 random read IOPS. The next fastest we could find is Seagate's Nytro XP7200 which does 940,000. The 4.6 million number is amazing. 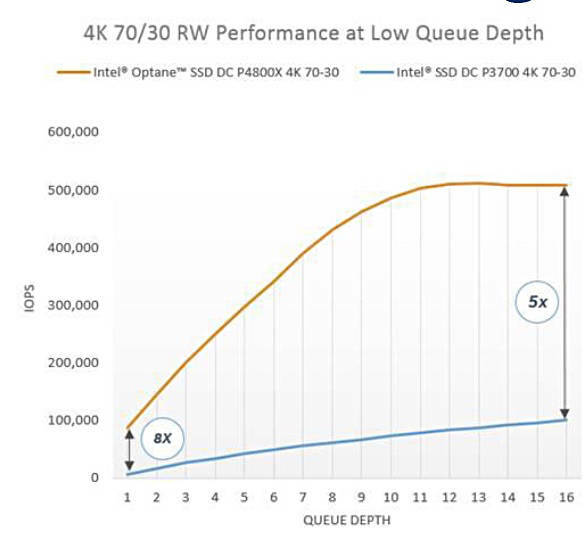 The Intel Optane SSD DC P4800X is spec’d at queue depths at or below 16, which is where the figures come from on that slide. The P3700 specs are at much higher queue depths. At a QD of 16, Intel Optane SSD DC P4800X is 10x better than the DC P3700. So the P4800X's random read IOPS number is less than 4,600,000 but we don't know by how much. Grrr. The 70/30 mixed IOPS value for the P3700 comes from an Intel webpage and applies to the 400GB P3700. With regard to the QoS the improvement of 60x at 90 per cent and 77x at 99.99 per cent means the difference between the two percentage levels is reduced, which is a good thing. Intel suggests the P4800X is used as fast storage and cache or to to bulk out DRAM, with its PCIE 3D NAND SSDS providing a tier of storage below Xpoint. Future Intel Xpoint DIMMs will also increase the memory pool in a server. The company also claims that the DC P4800X integrates transparently into memory subsystems, thanks to “Intel Memory Drive Technology” that loads after the BIOS but before the OS. That software makes it possible to create a single pool of memory comprising DRAM and the P4800X SSD to emulate a single volatile memory pool. This will work on any OS, but does need a Xeon CPU to make the magic happen. Optane SSDs can provide DRAM-like performance, it says, in select applications, such as ones with matrix multiplication with optimised data locality. Chipzilla's keen to point out Optane will be cheaper than DRAM, too. Listed OEMS for the DC P3800X include Dell EMC and HPE, both of which plans to use it as a tier of cache, plus Lenovo, Nutanix and Supermicro. As for how the P4800X' performance compares to Intel's original 3D XPoint performance claims - such as being 1,000 times faster than flash with up to 1,000 times flash's endurance and 10 times denser than conventional memory - we're bored with the whole farrago and don't intend to go there. We're also told that Optane will eventually make it onto DIMMs, but there's no timeframe for that happening.